320. 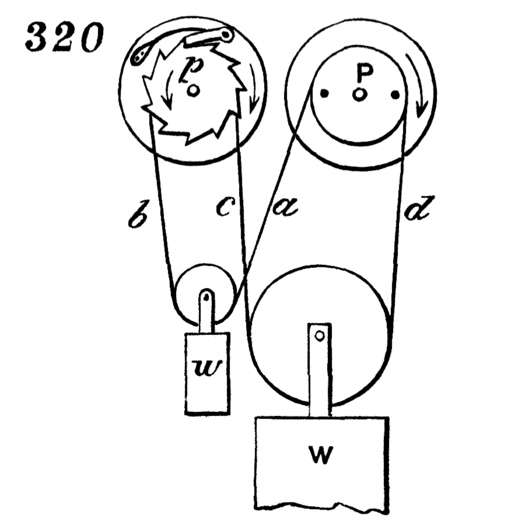 Endless chain, maintaining power on going-barrel, to keep a clock going while winding, during which operation the action of the weight or main-spring is taken off the barrel. The wheel to the right is the “going-wheel,” and that to the left the “striking-wheel.” P is a pulley fixed to the great wheel of the going part, and roughened, to prevent a rope or chain hung over it from slipping. A similar pulley rides on another arbor, p, which may be the arbor of the great wheel of the striking part, and attached by a ratchet and click to that wheel, or to clock-frame, if there is no striking part. The weights are hung, as may be seen, the small one being only large enough to keep the rope or chain on the pulleys. If the part, b, of the rope or chain is pulled down, the ratchet-pulley runs under the click, and the great weight is pulled up by c, without taking its pressure off the going-wheel at all.